I’ve been organizing my pictures from our Scotland/Ireland golf trip this week, selecting a few for my post on our trip to Ireland which I will share next week. I find getting back to my routine after an extended vacation is difficult especially finding time to catch up with my blog and all my friend’s blogs. I’m slowly but steadily getting back up to speed. 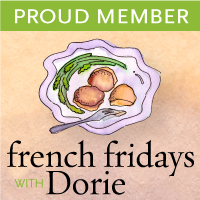 This French Fridays with Dorie recipe for Provençal Olive Fougasse from Around My French Table by Dorie Greenspan is one from the book that I’ve looked forward to baking. I also didn’t want to miss another French Friday as I’ve missed quite a few because of my travels. I was so happy with my olive fougasse that I think I’ve found a new favorite appetizer that very happily goes with a slice of soft goat cheese, a glass of wine and a few nibbles of olives. Especially love the crispy edges of Provençal Olive Fougasse smeared with a lump of soft goat cheese. I took a bite, closed my eyes and for a minute imagined I was in the South of France sitting outside at a café with friends enjoying a warm Summer evening with a chilled glass of rosé in front of me. Fougasse is a type of flat bread associated with Provençe where the addition of olives and fresh herbs such as rosemary is quite common. One of it’s characteristics is a pattern resembling a leaf or ear of wheat that is slashed into the rectangular shaped dough before baking. The bread is rustic,easy to make and fun to serve with cheese or olives as an appetizer. As we have been asked not to write out the recipes for FFWD I will share a link to Dorie’s recipe at Serious Eats which is from Around My French Tableand exactly the same recipe I used to made my olive fougasse. A few notes on making olive fougasse that I want to share, first off the dough can be made the day before and held in the refrigerator over night. The next day shape and bake off your bread, which I think is very convenient for entertaining. The loaves can be served whole and guests should tear off pieces to nibble. I would serve fougasse with wine, olives and goat cheese before dinner as a beautiful Summer appetizer. Another way to vary the recipe is to use different types of salt to sprinkle on top before baking. I used black truffle salt which tasted delicious with the chopped oil-cured black olives blended into the fougasse dough. Also, don’t worry about creating a perfect shape or the slashes you make in the dough, this is supposed to be a rustic flat bread. I enjoyed making my fougasse this week, please check out the other contributors to this week’s French Fridays with Dorie and find inspiration for your own Provençal Olive Fougasse. What a beautiful spread of food… Lovely pictures. How is it that you make even rustic look GORGEOUS?! Patty – welcome back! Love this bread – it would be perfect for our traditional wine and appetizer nights that hubby and I enjoy. I think I need to by the Dorie cookbook so I can have access to all of these wonderful recipes. Nice photos!!! Patty, this bread look beautiful and very unique..love the shape and the way it turned out for you! I give you thumps on this one..
What beautiful loaves, Patty. I love the shape. I think this will be perfect for summer entertaining! I really appreciate your recipes, even though they are sometimes too advanced for my pantry. Patty, your fougasse is PERFECT! I love how your slashes stayed open…so beautiful! Patty you must have been gone for quite sometime. Because I haven't seen your posts in my inbox in a while. Glad to have you back and hope you had a nice trip. Your fougasse looks perfect and the blend of ingredients sounds wonderful. Every Friday I could kick myself that I forget about FFWD. There are just too many distractions and I forget to try the posted recipe. I love this bread and will only hope mine turns out half this good. Of all the recipes you've tried of hers so far which is your favorite? Patty, you created a beautiful setting for your fougasse! Your pictures turned out perfect. Glad you're back and I'm looking forward to reading about your trip. The whole setup is beautiful! You made a great fougasse. Glad you had such a great vacation! These fougasse look bakery perfect! Well done, Patty! Beautiful bread and so flavorful! One I have not tried yet – thanks for the inspiration. So pretty! Yours looks like it turned out perfectly! Your bread looks amazing!! I made a stuffed Fougasse once, but it did not look like this. Great job! What a beautiful bread this is, Patty. I bet it was so flavorful! Well, yours has the perfect leaf shape and the more perfect photo/presentation. I wish I'd added a bit more flour…next time. I'll remember what you have done as a party appetizer…looks so inviting! You are a great baker and I always enjoy reading your posts. what lovely bread.. and what a pretty table Patty!! so mediterranean!!! Beautiful setup! You're right… this is the perfect Summer appetizer spread. Gorgeous photos! What is my excuse, I haven't been on vacation and my routine is shot. I got the kid home last night and I'm hoping for a little slow down next week, we need to pick a date for sure. I made a fougasse once and put mango and garam masala in it, man was it good. But I'm a sucker for olives. and I both thought this was an easy recipe and so tasty. Wow! Your pictures are so lovely! We really enjoyed this bread too! The next time I make it I'm going to pick up some different flavored salts and give that a try. I know I said it already but your photos are seriously beautiful! Patty, Your fougasse looks beautiful! And your presentation and photos are gorgeous! So glad your back…I missed you! Hope your trip was fabulous! Happy Mother’s Day! Pretty pictures of a beautiful fougasse, Patty. I love olives in bread–even for breakfast smeared with butter and honey. However, the wine and goat cheese pairings sound even better! Welcome back, Patty! I can't wait to hear about your travels. What a lovely presentation and your fougasse looks wonderful. This is the first time eating and making it for me and I can't wait to make it again. Yes, this evokes a summer picnic in Provence! Your fougasse looks splendid! Just fabulous, Patty! Time got away from me this week, but I will make this one up. I've never been to Ireland, so am looking forward to your post! Fa venir voglia di spezzarlo con le mani e mangiarlo! Patty, Welcome back. Your last photograph is drop dead gorgeous. It could be the cover of a cookbook OR a brochure for the Côte d'Azur. Do something with it. Everything you said about this fougasse is exactly on target. Isn't it delicious? I'm expecting you to invite all the Friday ladies over for a party! Your table looks amazing! Patty-your French style focaccia is absolutely gorgeous. Love the slashes in them. The photos are superb, and elegant! I saw this on another blog, it sounds wonderful! I think I might just have this for the whole meal and skip the rest, deal? Hi Patty, This is definitely the most convenient bread recipe I've ever made. And it tasted delicious. I love that you spread it with goat cheese. Yum! The salt sprinkled on top is part of made this special, so your thought of trying different salts is brilliant. I'll try that next time (maybe pink Hawaiian salt with sun-dried tomatoes?) Welcome back from vacation. Looking forward to reading about your travels. What beautiful bread! And it is so good to know that you can make it a day ahead! I love baking bread, but sometimes feel like I can't fit it all in. Can't wait to hear about your trip- I've always wanted to go there. This fougasse is gorgeous! I need to dust off my FFWD book and try some of these wonderful things I've been drooling over on Fridays. Your fougasse looks fantastic, Patty. I'm looking forward to reading about your trip! we shared this one with some friends who really wound up liking it too! We just went to Scotland ourselves! Where did you go within the country? We spent five days in Edinburgh! Your table setting is just gorgeous, and your bread looks perfectly rustic and delicious. Yum – now I dreaming of eating this bread with a hunk of goats cheese. Welcome back – hope your holiday was fab. The goat cheese is a great idea. We liked this bread too, and I am glad that my bread resembled yours. Didn't realize it was going to bake that flat. Welcome back Patty:) Your Fougasse looks perfect! It has been on my list of breads to bake for a while now. When I finally do I'll come back to re-read your tips. Thanks! Stunning, Patty. From the moment I saw your little sneak peek image, I couldn't wait to see the final product, it was already so beautiful! I would be so happy with this bread and goat cheese for dinner tonight! Patty your fougasse is just gorgeous! Beautiful, beautiful job with this!